...and it's time to workout. 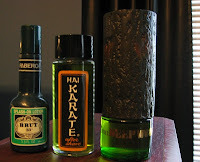 Do they even sell Hai Karate anymore? Also whats that one on the right. Nope, I don't think so, I found a full bottle at a yard sale. Actually I'm surprised that it smells kinda nice. The "log" one is Avon's Deep Woods. It smells just like Brut.